KIEV, Ukraine -- UNESCO experts have expressed their anxiety about the endangered historical monuments in Ukraine that are in a critical state of disrepair, Press TV reports. 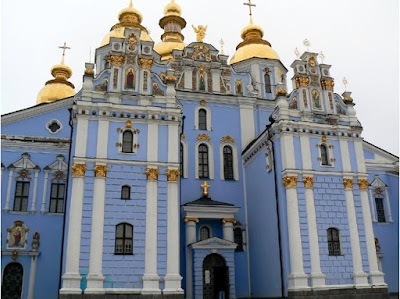 St Michael's golden cathedral and Kyiv Pechersk Lavra are among the religious and historical monuments in the European country that are almost near the edge of oblivion. Experts are worried that as the monuments are often situated down town, they would be easily picked by the developers and construction companies. “UNESCO again and again points to the problem of preserving heritage in Ukraine. This is a great shame for us that the UNESCO and other organizations raise the alarm. Of course they consider us as the barbarians who are unable to value the masterpieces,” Oleksandr Bryginets, a member of the Kiev City Council told Press TV. Experts say the authorities cannot afford saving the country's historical heritage due to poverty, as the total reconstruction costs hundreds of millions of US dollars. According to the experts, more than 50 art memorials in Kiev have disappeared from the city map in the recent years.